The Junior Marine Biologist program is offered to 3rd-8th grade students. The students participate in camp-outs, nest relocation, nest escavations and hatchling releases. They learn to collect and report data like a Marine Biologist and have lots of hands-on sea turtle experiences. 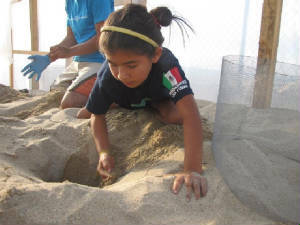 Look for our Junior Marine Biologists helping out at Sea Turtle Hatchling Releases in Todos Santos. This program is free to local students. If you know of a local candidate, or if you are interested in sponsoring a student for this project please contact us!